This book describes the unfolding of a global phenomenon: the legal prohibition of physical punishment of children. Until thirty years ago, this near-universal practice was considered appropriate, necessary and a parental right. But a paradigm shift in conceptions of childhood has led to a global movement to redefine it as violence and as a violation of children’s rights. Today, many countries have prohibited it in all settings, including the home. This remarkable shift reflects profound cultural changes in thinking about children and their development, parent-child relationships, and the role of the state in family life. It has involved actors in many sectors, including academia, government, non-governmental organizations and children themselves. 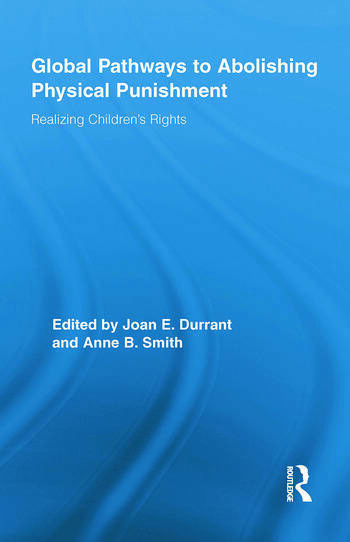 Documenting the stories of countries that have either prohibited corporal punishment of children or who are moving in that direction, this volume will serve as a sourcebook for scholars and advocates around the world who are interested in the many dimensions of physical punishment and its elimination. Joan E. Durrant is a Child-Clinical Psychologist and Professor of Family Social Sciences at the University of Manitoba in Canada. Her research focuses on the psychological, cultural, legal and human rights dimensions of corporal punishment of children. She was the principal researcher and co-author of the Canadian Joint Statement on Physical Punishment of Children and Youth; a member of the Research Advisory Committee of the United Nations Secretary-General’s Study on Violence against Children; and a co-editor of Eliminating Corporal Punishment: The Way Forward to Constructive Discipline (UNESCO). She has been active in public education on the prevention of child maltreatment in Canada and internationally. Anne B. Smith was the director of the Children’s Issues Centre (CIC) at the University of Otago in New Zealand for 12 years, and has been a researcher and writer on childhood and child development for many years. Her book, Understanding Children’s Development, has been read by practitioners in many child-related fields. Anne also led the CIC team which wrote the influential report The Discipline and Guidance of Children: Messages from Research, and is involved in public education about research on the effects of physical punishment. She is currently working on a variety of research studies, including projects on children as citizens, early childhood education and family discipline at the University of Otago.